A series of transactions beginning last winter involving Brookfield Asset Management and Rouse Properties (a New York-based mall developer in which Brookfield has a substantial investment) illustrates how complex financial moves with related parties can prove remarkably advantageous. The backstory: Rouse Properties, a developer of Class B malls (a real estate industry term referring to malls that are non-dominant competitors in their region, with sales of less than $400 a square foot), was spun out of General Growth Properties in August 2011. Lasting a month, Rouse’s rights offering never reached the $15 level but instead of the embarrassment of a failed deal—less than 15 percent of Rouse’s non-Brookfield shareholders participated in the offering—Rouse got its money. That’s because Brookfield “backstopped” (or guaranteed) the completion of the deal—for a $6 million fee. After the deal was done in March 2012, Brookfield owned an additional 11.35 million shares, taking its stake in Rouse from 37 percent to 54 percent, giving it effective control over the company. Of note, Brookfield was able to do this without paying a control premium to Rouse’s investors. 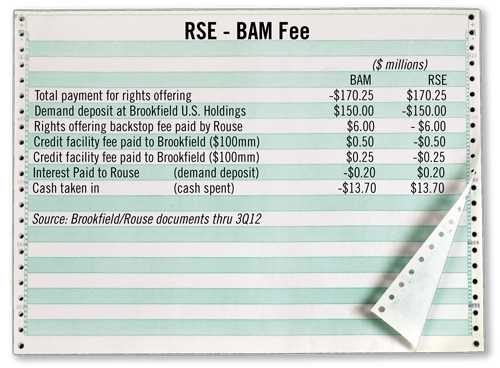 Shortly after the rights offering was closed, Brookfield and Rouse engaged in a series of transactions that seem to show how Brookfield obtained a large block of Rouse shares by spending only $13.7 million. It began January of last year, when $150 million of the cash Rouse raised was transferred to a wholly owned Brookfield subsidiary, Brookfield U.S. Holdings, that pays Rouse an annual floating interest rate of Libor plus 1.05 percent. According to Rouse’s filing, this was structured as a demand deposit due to mature on Feb. 14 of this year. No reason was given in either company’s filings for making the demand deposit at BBB-rated Brookfield as opposed to a traditional bank, like A-rated J.P. Morgan. At the same time, Rouse opened a $100 million credit line with Brookfield U.S. Holdings that costs Libor plus 8.5 percent, plus a onetime initiation fee of $500,000, and had made $250,000 in interest payments through the third quarter. To date, the credit line does not appear to have been touched.